About a year and a half ago, a post on LetsRun led me to She was Once a Runner, a blog written by an anonymous runner about her college running career, an experience destroyed by a disturbed psyche and an unhealthy environment filled with her toxic coach, teammates, and parents. Quite different from the usual running books you see, like Running with the Buffaloes and Running for the Hansons, but unfortunately a story that proved to be all-too-familiar with many athletes on LetsRun, who all chimed in with their own experiences as they waited eagerly for updates. When the author stopped updating her blog (she did eventually publish the rest of her story on Smashwords), one poster managed to get in touch with her, posting an interview with SWOAR's author on her own blog, Training on Empty. 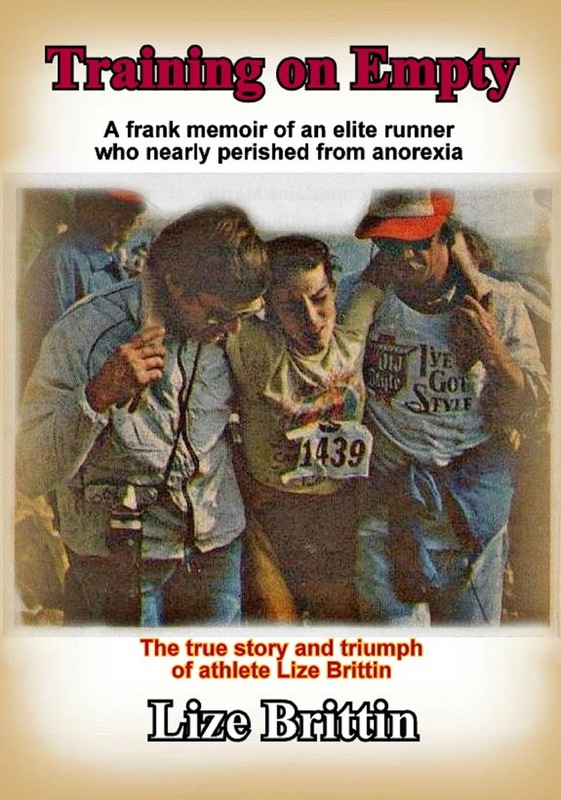 This poster was Lize Brittin, whom those of you up on their running history trivia may recognize as four-time Colorado state cross-country and track champion, Pikes Peak Ascent record holder, and elite mountain runner. 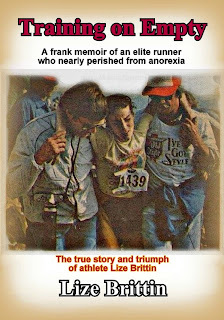 However, Brittin also struggled with an eating disorder, one that would eventually end her elite career (and nearly her life). Training on Empty (the name of her book as well as her blog) is the story of both her fight with the disease and how she eventually managed to overcome it. Training on Empty is dark and disturbing (moreso than I even expected, having previously read both Brittin's blog and the full text of SWOAR), yet is also somehow captivating and impossible to put down, as Brittin tells the story of her troubled childhood and dance with death with the same easy to read style with which she writes on her blog. A definite page-turner, I finished it in a day. Though anyone who reads her blog knows how the book ends (and anyone with a shred of common sense can see that she must be alive if she wrote the book), I still found it impossible to put down until I saw how Brittin found her way out of her personal hell, a hell into which she spent years spiraling deeper and deeper, and a hell from which many never escape. Training on Empty is also refreshing in that it's a story told from the perspective of someone who has been there: been there as an elite athlete, and been there at the lowest depths of an eating disorder. This isn't a textbook written by some psychiatrist who's detached from his writing, nor is it some psychology grad student's thesis that he wrote just so he can graduate. This is the personal life story of an athlete who has been at the very top...an athlete who also happens to be a woman who suffered from an eating disorder and who has also been at the very bottom. Brittin spares no details in her description of her struggle. There is no glorification or romanticization, just pure, brutal, painful, terrifying, and heartbreaking honesty. Considering how dark this book gets, it's almost surprising that there was a light at the end of the tunnel at all for Brittin. That light at the end of the tunnel is part of what makes this book so powerful...it's easy for a psychiatrist to write a book on something in which they specialize. It's much different when you realize how Brittin opens herself to the world, and the ending has the powerful potential to give the reader that glimmer of hope that despite the fact that it's a terrifying path to let go of the one thing that you feel is keeping you safe but is also simultaneously blocking your path to recovery, there can be happiness on the other side of the scary part. Interspersed between the biographical chapters on Brittin's life are chapters containing information on eating disorders. Most of this information I have seen before, but it is certainly informative for those who have not. However, I definitely enjoyed ("enjoyed" may not be the right word here, but you know what I mean) the biographical chapters better. Brittin's writing truly shines when she talks about her own experiences, and the other chapters lack some of the style and personality that makes both the biographical chapters and her blog so interesting. However, they definitely serve a purpose in the book and certainly have the potential to help inform many people about eating disorders. I'm glad that Brittin finally explains why coach Bobby McGee was such an important figure in her life. She's mentioned him numerous times in her blog, but I must have missed the part where she said what he's done for her. Training on Empty finally explains his impact on her life. Also a cool note: the forward is written by Lorraine Moller, Olympian and author of On the Wings of Mercury. Also a very good and highly recommended running book (and very different from Training on Empty). While I would never consider Training on Empty "light reading," I do think it is an absolute must-read for coaches of any sport where eating disorders are prevalent (and not just women's coaches, but men's coaches as well, since men suffer from eating disorders too). This is a book that anyone who advises athletes, especially young athletes, should, without a doubt, have on their bookshelf (well, technically on their computer, tablet, or eReader, but I digress). This book is also great for anyone who could use a little bit of hope that yes, you can get through this (though there is potentially triggering content...you know who you are if this will have a negative effect on you). And not just for those suffering from eating disorders, but anyone struggling with self-image issues or any type of mental illness or addictive behavior. Finally, this book has the potential to spread awareness. For anyone with a loved one, friend, or teammate who suffers from disordered eating patterns, or for anyone who just seeks to understand the disease from the viewpoint of an anorexic, Training on Empty is extremely informative and eye-opening. I will warn you though that this book is not something that you should give a little girl who's just taking up running and who you want to scare away from eating disorders...mental illness does not work that way, and this book would likely terrify and disturb her. Full disclosure: Nothing to disclose, I bought this book myself. I've never met Lize in real life, though I do read her blog and have exchanged emails with her in the past...though I didn't even discover her blog until I moved out of Boulder, so it's not like I started reading that because she lives in Boulder either. The opinions expressed in this review are mine, and do not represent the opinions of Lize or anyone else. As usual, your writing has peaked my curiosity. I'm going to have to read this book. I also thinking about checking out her blog too. I hope you have a chance to check it out, Ken. She's a very talented writer. Thanks for reading!